EASTER SALE Ivory Flowers Button Ring in Silver with Rhinestone Centers. Adjustable Size Ring. Handmade Jewelry. Vintage Button Ring in Bronze with Fuschia Rhinestone. Adjustable Size Ring. 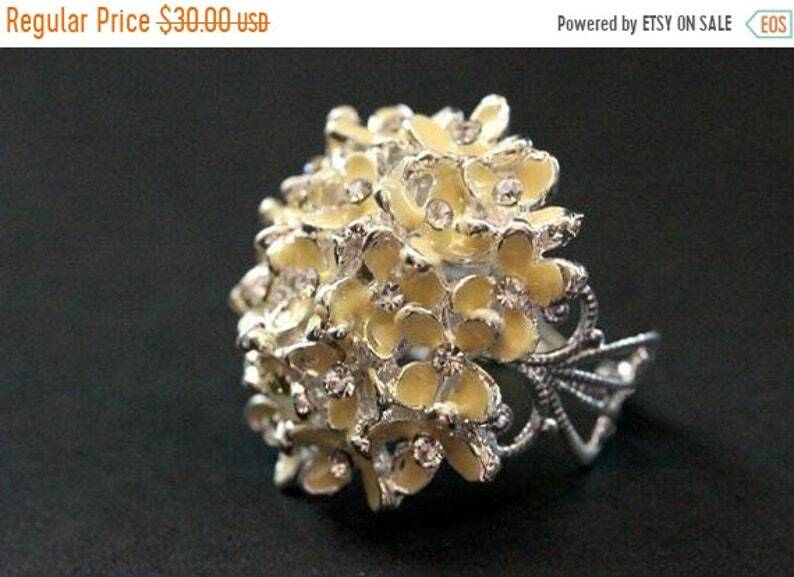 A handmade ring designed from a pretty re-purposed silver tone metal button with clusters of yellowed ivory flower clusters and tiny rhinestone flower centers that has been set upon a matching silver plated filigree ring base that's adjustable from size 6 and up. This handmade button ring is adjustable from size 6 and up, making it comfortable no matter the size of the wearer's fingers as well as ideal for switching from finger to finger depending on mood or preference. Stop by and visit http://stumblingonsainthood.etsy.com to see more handmade designs! EASTER SALE Ivory Rose Ring. Ivory Flower Ring. Gold Ring. Silver Ring. Bronze Ring. Copper Ring. Adjustable Ring. Handmade Jewelry. EASTER SALE Summer Mandala Flower Ring. Floral Button Ring in Silver. Adjustable Ring. Handmade Jewelry. EASTER SALE Metal Flower Ring. Flower Button Ring. Silver Button Ring. Adjustable Ring. Silver RIng. Handmade Ring. Handmade Jewelry. Sage Green Daisy Flower Earrings with Rhinestone Centers and Silver Post Earrings. Handmade Jewelry. Magenta Daisy Flower Earrings with Rhinestone Centers and Bronze Stud Earrings. Flower Jewelry by StumblingOnSainthood. Handmade Jewelry. Blue Starfish Earrings with Silver Post Earrings Back. Handmade Jewelry. Hot Pink Rose Earrings. Silver Stud Earrings. Flower Earrings. Post Earrings. Flower Jewelry. Handmade Jewelry. Vintage Button Ring. Pink Rhinestone Ring. Rhinestone Flower Ring. Adjustable Ring. Handmade Jewelry. EASTER SALE Turquoise Rose Ring. Turquoise Flower Ring. Gold Ring. Silver Ring. Bronze Ring. Copper Ring. Adjustable Ring. Handmade Jewelry. EASTER SALE Universe Mandala Button Ring. Silver Button Ring. Silver Ring. Aged Silver Adjustable Ring. Handmade Jewelry. EASTER SALE Gray Blue Rose Ring. Blue Grey Flower Ring. Gold Ring. Silver Ring. Bronze Ring. Copper Ring. Adjustable Ring. Handmade Jewelry. EASTER SALE Mermaid Ring. Pewter Button Ring. Silver Button Ring. Adjustable Ring. Silver RIng. Handmade Ring. Pewter Ring. Mermaid Jewelry. EASTER SALE Star Mandala Ring. Antiqued Silver Button Ring. Silver Star Ring. Adjustable Ring. Handmade Jewelry. Pink Rose Ring. Light Pink Flower Ring. Gold Ring. Silver Ring. Bronze Ring. Copper Ring. Adjustable Ring. Handmade Jewelry. Love Mandala Ring. Heart Button Ring. Heart Ring. Silver Button Ring. Adjustable Ring. Silver RIng. Handmade Ring. Handmade Jewelry.